Palsy in the Bible: What is it? Palsy is a general term which can refer to various types of paralysis. In the Bible it seems to be used for various types of conditions having to do with motor control or lack of feeling. This could be a permanent or temporary paralysis. It could also be related to seizures. Some translations of the Bible use the word paralytic. Palsy could affect the whole body, one side or just a single limb or digit. Of course there are many diseases today which still bear the name palsy. Wikipedia has a list of some of the common ones. One type of neurological problem that might be called palsy is catalepsy which is a condition of the nervous system. It is a muscular stiffness which is usually accompanied with a lack of feeling or sensitivity to pain stimulus. It can be a symptom of epilepsy or a disease like Parkinson’s. The most common use of the word palsy in the Bible is the story of the man who was brought to Jesus and let down through the roof of a house by his friends. This story is found in Matthew 9, Mark 2 and Luke 5. Besides this man, there is a story of Jesus healing the centurion’s servant who had palsy in Matthew 8. 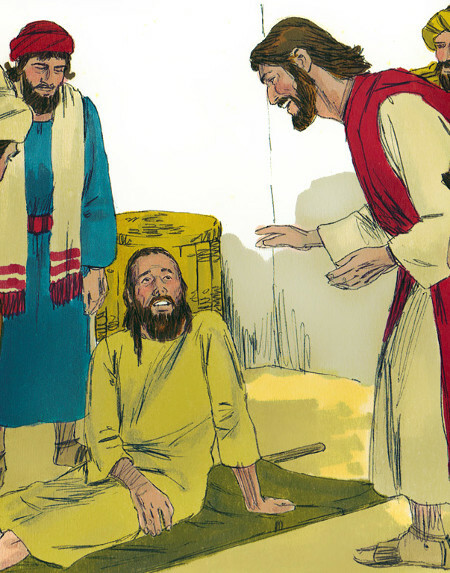 Peter also healed a man with palsy in Acts 9. In all the above cases the word used for palsy is παραλυτικός (paralytikos) and παραλύω (paralyo). These are similar words that mean a relaxing of the muscles or a general weakness. The idea of the Greek word is that it is along one side of the body. In Matthew 12 a man with a withered hand was healed by the Lord. The word in that instance is one that means to dry up. Specifically it can be applied to a body part that has not gotten the proper fluids. This is the word ξηρός (xeros). Though this is not the word palsy, it could be related to catalepsy mentioned above. Previous Previous post: Statements of Christ on the Cross: Father, into thy hands I commend my spirit.